Pictured above is a recent installation we have completed in Danville, CA. This unique and custom designed iron door features faux are sidelights and the intricate scroll work that is hand forged by fire. The black finish provides a dramatic contrast to the neutral tones of the stonework and really seems to revive this home and give it a fresh new look. 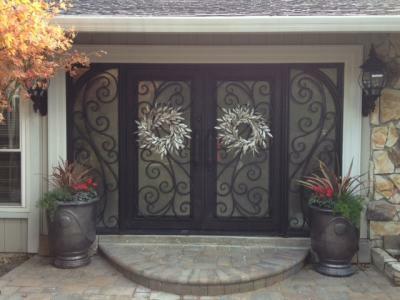 Signature Iron Doors specializes in custom designs and finishes ensuring that each and individual door is its own piece or artwork. Our doors not only provide ornate decoration but also provide security and longevity and are made with only quality materials and craftsmanship. If you are contemplating rejuvenating your home with wrought iron we invite you to take a look at our website and contact us to speak to a representative who can help walk you through the design process and assist you in realizing your home true potential.